I’d argue that it’s traffic, traffic cost, and keywords in the top 10 that matter most. You have to start somewhere though and often times people get caught up in total keywords. A tool like SEMrush tracks keywords in the top 100 positions of Google. That’s 10 pages! And you probably aren’t seeing much traffic from those lower pages. Is it cool to monitor the growth? Sure! Yet you might think something is going wrong when you see those keyword ranking numbers drop. While Jockeying for position, keywords will often fall in and out of the top 100. This should not be something to be concerned about in your early days of building a website. When you first build a website it’s easy to get lost in the metrics. And, not be really clear on what’s most important, or how you move the needle. How do you actually change or grow the website? I’ve been building websites for years, and I’ve been ranking on the search engines for years for multiple businesses, on multiple platforms. And so, I really understand what moves the needle, and what ranks well on the search engines. I really stay on top of the algorithms, and the changes with Google. But, mostly I focus on the consumer. Because I’m so focused on adding value to my customer, I’m rewarded on the search engines because my page is the most relevant for that search query. This is the work that I do every day, and I drive a lot of business to my Las Vegas real estate website through this. So let me show you some of the metrics that are important, and what you don’t need to work about. SEMrush monitors organic traffic, desktop traffic, mobile traffic and so forth. It monitors your search engine rankings on both desktop and mobile separately, not together. It measures your organic traffic, versus your pay per click traffic. So, if you don’t understand necessarily what you’re looking at, you’re going to get kind of lost in these numbers. And potentially be putting too much weight on something that’s not even important. The first one in this metric is keywords (19.5K). This website will float anywhere between 15,000 and 25,000 keywords. And I don’t worry about that, at all. I want to know that my website is growing in the important keywords, and I want to know that I’m getting traffic for important keywords, and I want to be able to raise up those important keywords. What I don’t care about is how many keywords rank on page 10 of Google. So what? It makes no difference. The 19,500 it’s actually tracking and reporting are keywords that rank in the top 10 pages of Google. It’s a top 100 system for your overall organic traffic earning keywords. If you’re ranking on page four and beyond, you’re not seeing much benefit from that anyway. You might want to look at it, only as a general measure to see if you’re getting more into that top 100, or less than the top 100, but it’s nothing ever, ever to be concerned about, or worried about, or even overly excited about if you suddenly have more. The second number (15.6 showing in the image) is your big number. It measures how much traffic you are getting from those keywords. You want to be watching for growth on your traffic number, more important than the total keywords. Next, you have your traffic cost. (21.1 in the image). This would be if I were to pay for the traffic I’m earning organically. So if I were to do pay per click on Google AdWords, and bid on those same keywords, how much would I be spending a month? In my case, I’d be spending $21,000 a month. That’s pretty huge. The higher that number goes, that indicates the more valuable your website is. Now, that doesn’t always mean those keywords are making you money. Sometimes you might be generating a whole lot of traffic that has a high dollar value, but those keywords aren’t turning in to any kind of conversions, and that’s a whole other lesson. Now, let’s go back to keywords for a second so that you can understand what is important. 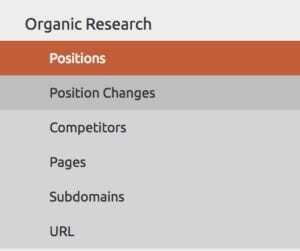 If you are dropping in and out of the 100, and you want to see what keywords are dropping in and out, you click on position changes once you are in your organic research view of your ranking keywords. This is not a bad idea to keep a pulse on, because this is something you can control. If you see keywords moving into the top 100, there are things you can do to push them up, to make sure they stay there. 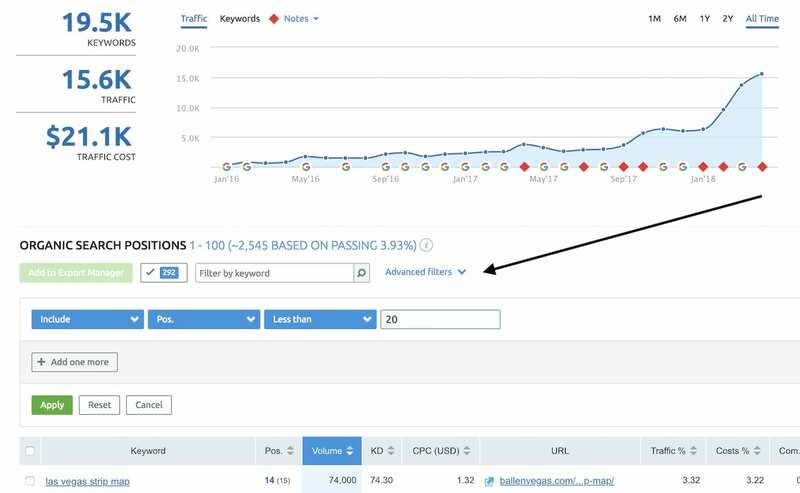 If you see keywords dropping out of the top 100, you can go back and try to rescue them. Although, I don’t think that’s the best use of time until you’re already at a level like where I am, where you’ve already really, really focused on pushing all of your top 20 up, and this is just kind of a daily metric that you do. I’ll check the pulse on this daily. I won’t spend a ton of time on it. So if I click on the last date reported, in my dashboard, it says that I gained 166 new keywords, and I lost 144. Now, I’m not concerned about this in any way shape or form, because most of these are going to be low position keywords. If they were lost, they were only on page seven to 10 generally. Or, if they’ve gained, they’re probably not ranking super high, so none of these are going to be significant in either direction. But, let me show you what I can do with them. I’m going to click on the 166 new. Now, you’re going to see the same keywords moving in and out all the time until they get some stability. Because, what’s happening is Google’s discovering them, putting them in the index, giving them a ranking position, and then testing to see how they perform. I sort the report by volume. This is just a search volume for a keyword phrase. How many times per month is that keyword being searched? Now, you would assume that the highest volume keywords are the ones you should work the most on. Maybe, maybe not. Let me give you an example. “Clark County Assessor” is a keyword that entered in position number 40. That means I’m on the bottom of page four or top of page 5 on average. Everything, depending on location, and mobile device, and desktop, and browsers, and all that information, personalized search, is going to change that. But the average is bottom of page four, so it could be top of page five. So, how much effort and energy do I want to spend moving up that keyword phrase Clark County Assessor? Well, let me tell you a couple of things. I would go look at the competition. I would go over here to the SEO content template, which I have another video on. And I would run a test to see what it would take me to rank for Clark County Assessor. I can also hover over to the right and find the link option that SERP (Search Engine Results Page). If I open that, it’ll show me a snapshot of who was ranking for Clark County Assessor when it did this last result or checked the ranking. So number one is going to be Clark County Assessor, of course, number two is Clark County Assessor, number three is Clark County Assessor, number four, Clark County Washington, instead of Nevada then Clarke County Illinois. So it’s the actual offices themselves ranking. The odds that I’m going to take one of those top sports for Clark County Assessor are very slim. Now, that never means it’s impossible. It means it’s going to be challenging. So then I have to ask myself, “If I were to rank for that term, Clark County Assessor, is that going to bring me any business?” And, my answer is probably not. So I would pass on that one. I never care about that one again, if it’s moving in or out of that top 100, doesn’t really make that much of a difference to me because I’ve already decided it has little value or too much competition to be worthy of the effort. And the next one, “houses for rent in Las Vegas” , a longtail keyword, premiered at 86. Well, that makes sense, because I did not have rentals on my website. A few weeks ago I started adding rentals on the website. I did it really, purely as a traffic generator, just to get those people looking at houses on my website, so that I can take that number one spot. So I’m going to do the same thing. I would typically do an incognito window or a private window that is not tracking my personalization results and look at the Google search engine results page (SERP) itself. First, I see the ads, then Zillow, Trulia, Rent.Com, Realtor.Com, Homes.Com, Hotpads, Zumper, Craigslist, Robinson Property Management. Okay, so what I can see here based on my quick glance, is I could land on page one organically. How do I know that? Because there are locals on here. It’s not just all Zillow. But the best position I’m probably going to be able to take is position five or six because those large real estate portals are harder to beat for these highly competitive terms. If I felt like houses for rent in Las Vegas is going to be a profitable lead generator for me, and I want those types of leads, I would go after this one. But I don’t, because there again unless I’m just using this as a traffic metric, it’s kind of going to be a pain for me to get a bunch of rental leads. So, I would skip that one. Third Example: best shows in Las Vegas, position number 31. So I’m on the top of page four, or bottom of page three. 14,800 searches. This one I might do a little bit with, and let me tell you why. It’s hyper-local, and I do love the hyperlocal stuff. It generates interest from people that are coming in from out of town. It’ll boost traffic. So if I’m after a hyper-local piece that I just really want to rank higher so that I can get more of that visiting to Las Vegas traffic, and then try to capture them with calls to action, and IDX and what not, this one wouldn’t be too hard for me to move. I think I could get this one to page two at least. And if I don’t feel like I can at least get it to page two, I’m not touching it. This one appears to have some opportunity in my opinion and with more content pointing back to the page that ranks for Best Shows in Las Vegas, I believe I could boost the rankings. Watch the search volume. If it doesn’t have any search volume, and it doesn’t benefit you, then you don’t worry about it. These things are going to move in and out of that top 100 all the time. Now, here’s one I would care about at a glance, 89014 zip code. I’m obsessed with zip codes right now, that’s my focus is zip codes. So, any one of these that has a zip code, I’m going to pay attention to those. My strategy next is to go create content. I’ll go do a real estate market report for 89014. I’ll go add some more content to that page. I’ll go post some recent sales in 89104 as a blog post, and drive it back there. Or, add new developments, or new construction, or new places to work in 89104, and I’ll do blog posts, and I’ll drive all that traffic back to this parent page. And then I’ll start pushing it up in the rankings. There’s a really cool component here before I let you go. Head down the filters section. Choose Advanced filters and using the drop-down menu, select positions and the next column less than 20. So, what I’m looking for are only keywords that rank in my top 20, top two pages of Google. Guys, these are what matter, right here. What ranks in your top two pages of Google? If you can move those up one position, two position, three positions, five positions, it’s incredible what happens. If you can move keywords from page two to page one, they will change your world. Not long ago, I wasn’t even ranking for the term “Las Vegas Real Estate”. It has 12,100 monthly searches, and suddenly I’m on page one. Now, it’s earing 2% of the traffic of those 19,000 keywords. That’s massive. That’s going to grow as it grows to a higher position if it goes to seven if it goes to position six, position five, that could become 10 to 20% of my traffic ranking. This is what matters. This is what moves the needle. Las Vegas real estate agent doesn’t have that many searches. But Las Vegas Real Estate as a whole, 12,100 with a lot of competition. So I’m very, very excited about that. So I could do some work now to make sure that, that page moves up for the keyword phrase Las Vegas Real Estate. Things like some on page SEO, some backlinks, some internal linking strategy, anywhere I use the phrase Las Vegas Real Estate, making sure that it’s pointing to the homepage, where this one ranks. 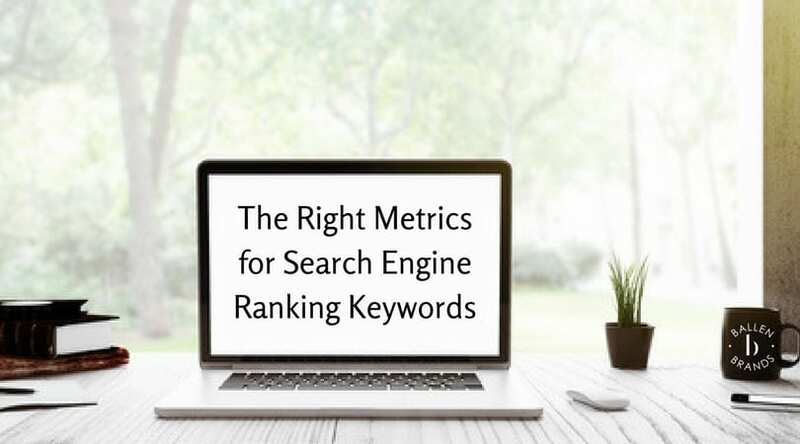 In summary, know what metrics are important, what metrics you want to pay attention to, and don’t get caught up in this total keywords number. That’s not the right number. It matters in a small scheme of things, but it’s not the right number to pay attention to. I want to see you pay attention to traffic, traffic costs, which is the value of your traffic, and these top 10, top 20 keywords. You have to know what numbers are important when you are tracking your SEO efforts. Is it total keyword rankings? Traffic? Traffic Cost (Value?). 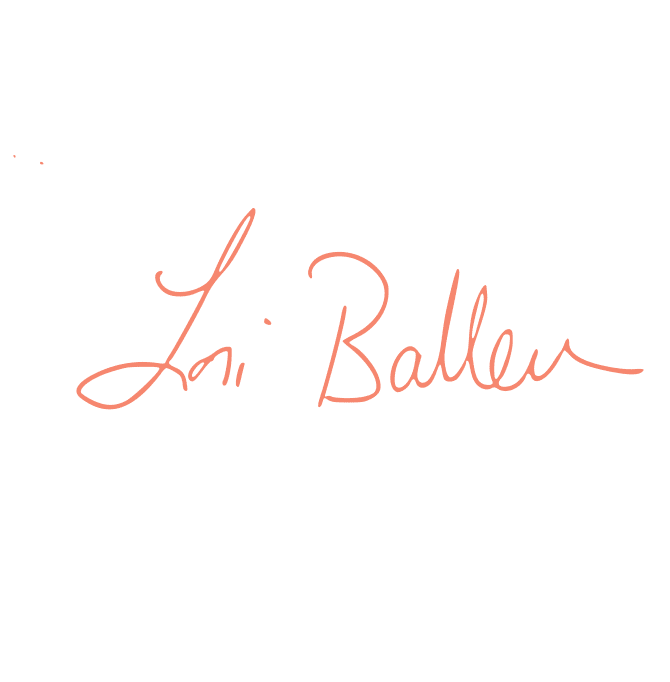 I'm Lori Ballen and In this video, I'll show you what metrics are important and how to find them in the SEMrush Keyword Tool.